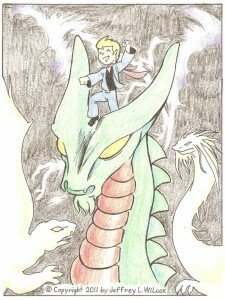 #16 Johnny Speed and the Midnight Dragons (manga and fantasy horror) The year 2012 isn’t the year that the world ends. However, the Earth populated by dragons does make the world scene interesting. From space they came, dragons of every size and description, and they descended on Earth in the thousands. Most of the dragons create chaos and destruction; but a few have befriended the humans. Johnny Speed, a high schooler, is one of these. With him and the dragons he has known the human race has a chance to survive into the future. Johnny and his dragon friends are another example of my exploration with Internet name generators. As I’ve said in earlier posts, I find the best results from those generators is to take the hackneyed answers, cut them up, and rearrange them into better titles/ideas. This post looked like it would be better in a manga/anime style. Hi Gang!! Here I am for my third go around with this art challenge. I have high hopes to finish with at least 30 new characters this year. Last year"s schedule was hectic for me, so I only did 16 drawings. And while that number doesn't count it here; it does mean I already have a dozen characters waiting in the wings, simply because I didn't have the time to draw them out. Onward and upward!!! There seems to be a few new things happening this year: there are a lot of people who started early, and a lot of them are damn good. This latter should encourage all of us to churn out better characters and art as the challenge wears on. Good luck to us all.